21Casino is licensed by the UK Gambling Commission and the Malta Gaming Authority and offers 24/7 support via live chat and e-mail. Like this a lot actually. Like this a lot. Two features that you’ll acknowledge straight away is just how clean and rapid the site is, like jarringly so. Just wait until you click on a game category tab, you’ll notice straight away just how ridiculously fast it loads up, and to be honest, the game categories are just a small part of an overall exceptional navigational journey that the guys at 21 Casino have created. I do have one criticism, though, and that’s that the site is just a little bit flat and a little bit basic. It’s not particularly beautiful, and it’s not going to win any awards for aesthetics, but it is functional. And I guess that’s all that matters. 21 Casino offer most of the popular payment methods out there including Visa, Mastercard, Neteller, Trustly, GiroPay, Sofort, Bank Wire, Finnish e banking, Interactive pay, UPaySafe, Ukash, Paytrail, Ochopay, Sofort Banking and Interac Online. The minimum withdrawal and deposit amount is £10. The maximum deposit limit is £100,000 and there is no withdrawal limit. Excellent! 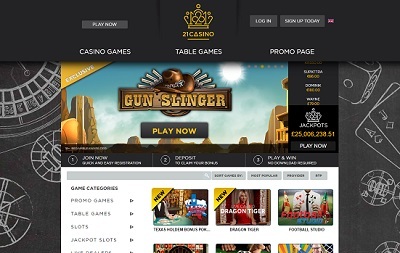 There are a huuuuuuge number of games available on 21 Casino – 900 in all – which includes table classics, live casino, slots, jackpots, scratchcards, instant-win games, bingo and virtual betting! Then when we drill down a little bit further and investigate what exactly is in each category we see that the selections of games is very, very lovely indeed – all the classics are there like Starburst, Rainbow Riches and Bonanza, plus in the progressive section you’ve got treats like Mega Moolah and Mega Fortune. Won-der-ful! Very good. Very, very good indeed, that’s what I say and that’s what this casino is. Verging on the excellent. I’ll start with the negative first, if that’s okay? And I say negative because there is only one, really. The look, that’s my problem with it, it’s not all that beautiful of a site, to be honest. But when it comes to everything else – the navigational journey, customer support, payment methods, the games – they’re all first class, and that’s why this has to be one of the better casinos out there. It’s not one of the bigger names on the circuit, but it’s a bloody great place to game, let me tell you.